No truer words were spoken about North America’s love affair with the automobile, from 1957 tailfin Chevrolets to Ford Mustangs through Chrysler minivans and Ford SUVs. But shifting economic sands, rising fuel prices and the spectre of carbon-emission-linked climate change are chipping away at that obsession. Although there is still nearly one car for every two people in the United States, a tectonic force – the fee-based sharing of cars and bicycles – is starting to be felt. Car sharing has existed for three decades, though only recently have the tremors of change caught the automobile industry’s attention. Last year, the car shopping website Edmunds.com reported that the share of new cars purchased by those aged 18 to 34 dropped 30 per cent over the five-year period from 2007 to 2011. This parallels a drop in the number of youth bothering to get a driver’s licence, according to a 2011 report from the University of Michigan Transportation Research Institute. Little wonder. The U.S. Department of Transportation says vehicles and maintenance are expensive, consuming more of the family budget than food. In addition to cost savings, car sharing for many is becoming increasingly convenient. Parked at networks across an urban centre, shared vehicles can be reserved for long or short periods of time. The cost is based on mileage or time. The model fits seamlessly with mobile technology like smart phones, which allow users to easily find and reserve a car. In a surprise move, car-rental giant Avis Budget recently plunked down nearly $500 million for 13-year-old Zipcar, the world’s largest car-sharing company. Earlier this year, Avis chief executive Ron Nelson admitted to analysts he’d “been somewhat dismissive of car sharing in the past.” But the company came to realize the concept and Zipcar’s 760,000 members (known as “Zipsters”) are complementary to its traditional car-rental business, which has been sluggish of late. The acquisition was a prudent move, says Susan Shaheen, co-director of the Transportation Sustainability Research Center at the University of California, Berkeley. “Although sustainability and public relations may have played a role in the acquisition of Zipcar, we view this mostly as a business decision,” Shaheen says. The purchase also allows Avis to tailgate Daimler AG. In 2009, Daimler, maker of Mercedes-Benz cars, launched its Car2go car-sharing subsidiary in Europe and North America, rolling out the snazzy blue-and-white Smart Fortwo – gasoline or electric powered – in urban centres. Andreas Leo, corporate communications manager for the Germany-based Car2go, says 60 per cent of its 280,000 members are younger than 35. The competition is healthy, not just for the industry but ultimately for the environment. Car-sharing membership is expected to reach 4.4 million in North America and 5.5 million in Europe by 2016, according to U.S. research firm Frost & Sullivan. The numbers raise a red flag for vehicle manufacturers. As more consumers choose to share vehicles, fewer are likely to purchase them. In urban areas, where car-sharing services are more accessible, this could lead to a reduction in road and parking congestion. The research firm said it might also bring an unexpected boost to electric vehicle sales, as plug-in cars appeal more to younger customers who are drawn to car sharing. Shaheen, who studies car and bicycle sharing in North America, says there were 26 car-sharing programs in the United States as of July 2012. Together, these programs boast 806,332 members and 12,634 fleet vehicles. In Canada, 101,502 individuals share about 3,200 vehicles from 19 national and regional car-sharing organizations. Shaheen and colleague Elliot Martin found in a 2008 survey that every car-sharing vehicle on the road replaces between nine and 13 vehicles. That means car sharing has resulted in up to 205,000 cars being taken off North American roads. How this results in emission reductions is trickier to calculate. For those who don’t own a car and rely mostly on public transit and cycling, joining a car-sharing program will lead to more emissions. For those who turn to car sharing because they want to get rid of their car, emissions are likely to fall considerably. Then there are new drivers who, without car sharing as an option, would be inclined to get their own car. Taking all of this into account, Shaheen and Martin determined that car sharing leads, on average, to a 43 per cent decrease in greenhouse gas emissions per household annually. They also observed that those who have switched from car ownership to car sharing reduced the number of kilometres travelled each year by 27 per cent. Of course, jumping into a car is not the only way to go – or share. Research out of the University of California also found that, as of January 2012, there were 19 bicycle-sharing programs in North America collectively representing 11,000 bikes, 1,000 bicycle stations and 216,400 members. No doubt, that number has increased over the past year – as has public awareness of bike sharing. 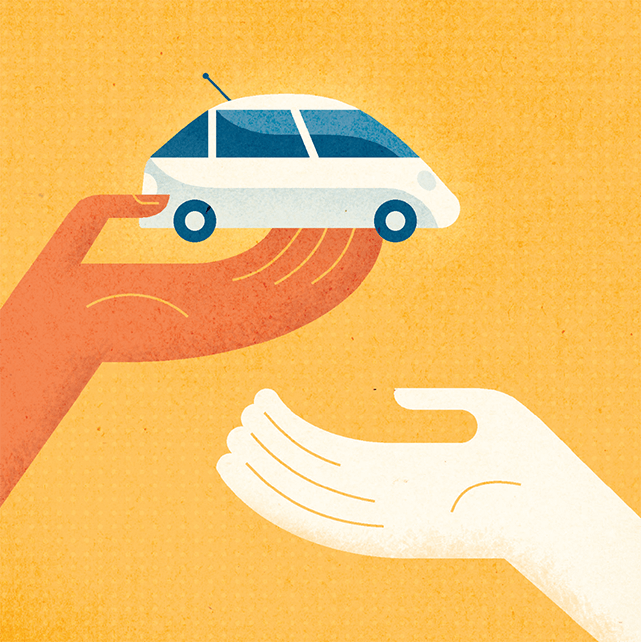 The wild card in the deck – or possibly the ace – is the peer-to-peer model of car sharing. One trailblazer is California-based Getaround, which connects private car owners with people who want to rent a vehicle for a short period of time. Those with a car – be it compact, truck or luxury wheels – determine the price per hour for use of their vehicle. Getaround, which handles the insurance and billing, gets a 40 per cent cut of the fee. The vehicle is equipped with a device that allows it to be unlocked via an iPhone app. About 10,000 cars are already listed on Getaround, and that’s just in five cities – San Francisco, San Diego, Austin, Portland and Chicago. “And we have big plans for 2013,” said Jessica Scorpio, co-founder and director of marketing. In Canada, Quebec’s Communauto is poised to launch peer-to-peer car sharing in its home province. Founded in 1994, Communauto is the largest car-sharing program in Canada with 27,000 members and 1,190 vehicles, including electric cars, says spokesman Marco Viviani. Communauto decided to introduce the peer-to-peer model to car sharing in the suburban and rural areas where it wasn’t profitable for the company to have its own fleet, Viviani explains. Communauto’s insurer, La Capitale Financial Group, has agreed to extend its coverage to those who sign up their vehicles.